The government today decided to reconvene Parliament from May 10 after the Assembly elections for enacting a comprehensive law on redefining office of profit, an issue that resulted in a political storm and has threatened the survival of BJP-led government in Jharkhand. The Centre today strongly defended the decision of the Immigration Authorities at the Wagah border over the denial of entry to the kin of Acting Pakistan Chief Justice Rana Bhagwandas saying "the denial was due to Justice Bhagwandas's family not having valid visa for Amritsar." Should high-profile cases of serious crime be referred to fast-track courts? Of course we would like to be supported in difficult times, but this is the way Indian fans are. Mr A R Antulay, Union minister for Minority Affairs, in his latest quest for empire building has now decided to use the Kashmiri pundits. Officially describing them as a “minority in need of aid’’ he has asked the Department of Personnel to allot him funds for their succor. Sunny Rawat, arrested in connection with the Meher Bhargava murder, today confessed before the media to having fired the fatal shot at her in a fit of rage. Seven residents of Lakhuwali village, located across the inter-state border, were killed in a head-on collision between two Jeeps last night. Five others received injuries, witnesses said. The Punjab Government has put the onus of bringing in new students and preventing cases of dropout in government schools on teachers, principals and district education officers (DEOs). In what could be a major relief to farmers and landowners of about 470 villages in Punjab, the Union Ministry of Environment and Forests has excluded over 65,670 hectares of cultivated and habitation land from the land covered under the Punjab Land Preservation Act (PLPA), 1900. Ripudman Singh Malik, a main accused in the Air India bombing case, who was acquitted after a lengthy trial, has admitted donating money to militant group Babbar Khalsa International (BKI) before the 1985 downing of the airline’s Kanishka flight that left 329 people dead. 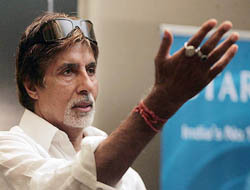 Bollywood megastar Amitabh Bachchan today said he was ''absolutely fine'' while facing the media for the first time since he got back to work after a three-month rest following intestinal surgery.